The HH80 series has been discontinued. Please see the OM-EL-GFX series as a possible alternative or contact our Data Acquisition Engineering department. This series of handheld units provides a unique feature for collector mode and a logging mode capability. When used in the collector mode only,the unit can save up to 5000 data items. When used in the logging mode only, it can save up to 20000 data items. 100°C≤T < 150°C ±0.4°C * For the accuracy when using a noncontact probe (900 03), see the accuracy ratings of the probe. accuracy of the non-contact probe. Collector mode: 0.5 seconds or longer when 1 channel is used. 1 second or longer when 2 channels are used. Logging mode: 1 second to 24 hours when 1 channel is used. 2 seconds to 24 hours when 2 channels are used. Data capacity 5000 data items when used in collector mode only. 20000 data items when used in logging mode only. Measurement data obtained in collector mode and logging mode can coexist. 5000 data items when used in collector mode only. Measurement data obtained in collector mode and logging mode can coexist. Under simultaneous 2-channel measurement, 2 data items are recorded at the same time. Reading of difference between the 2 channels is possible. 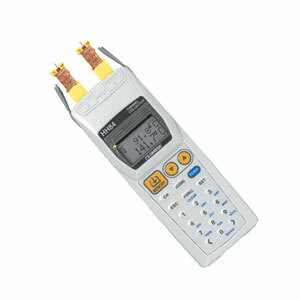 Communication function Conforms to EIA RS-232C standard. Simplified correction function None Corrects the measured data from thermocouple input within the range of ±20.0°C. is defined from the thermo-collector software. Serial I/O capability: A serial port conforming to RS-232C standard should be available. Thermocouple thermometer/datalogger with software and RS232 cable. Thermistor thermometer/datalogger with software and RS232 cable. 참고: Each unit comes with 2 type K beaded wire thermocouples, 2-AA batteries, software, and manual.